Looking for a way to spice up your food photography? Check out the latest addition to the Aviary shop - Foodie stickers! Beautiful and fun word art graphics to add to photos of your favorites meals and culinary experiences. Use them together with our Foodie Effects pack to create mouthwatering shots and give all your friends a serious case of food envy. Bon appétit! Did you know you can use Aviary to make color splash photography? The Splash tool lets you highlight certain colors in your photos while leaving others in black and white. If you scroll a little way over in the tool tray, you'll find the paint bucket icon for the Splash tool. If you accidentally color outside where you intended, use the Eraser tool to bring it back to black and white. And of course you can jazz up your color splash photography with simple word art stickers like this one from the Love pack. 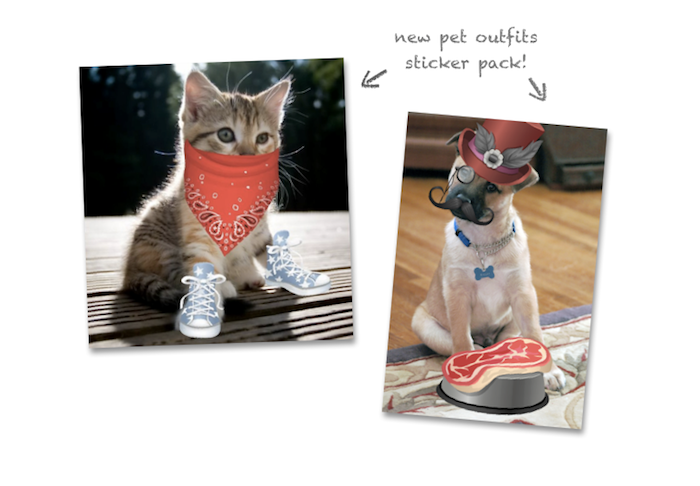 Introducing Doodles & Pet Dress Up - Our Newest Sticker Packs! Say hello to two new sticker packs for Android and iOS - Doodles and Pet Outfits. Perfect for blogging, scrapbooking and capturing fun summer moments with your pals, Doodles brings sweet scribbles to your everyday photography. For people who like dressing their kittens as bandits and dogs as debonair dandies, Pet Outfits is your dream come true. All of the cuteness, none of the clawed trauma of actually stuffing your cat into a frog uniform. Hoorah! Celebrate St. Patty's Day with Aviary's Shamrock Stickers! Happy (early) St. Patrick's Day! To celebrate this great, green holiday, we're announcing the release of the Shamrock Sticker pack in our iOS Showcase App. It's available now for a limited time only, so grab it while you can. Aviary Showcase users love seasonal sticker packs. Our Holiday pack, which we put out back in December, became one of our most popular sticker packs ever. So, we decided it'd only be right to continue the holiday sticker tradition, and thus the Shamrock pack was born. It features all the St. Patty's day stickers you'd expect like a four-leafed clover, pot of gold, rainbow, lucky horseshoe, and other green goodies. Plus, you can even dress your friends up like a Leprechaun with a hat, glasses, pipe, belt buckle, and some orange facial-hair. Have you tried out the Shamrock pack? Show your Irish spirit by sharing your Shamrock photos with us on Twitter! Today we're adding more awesome Valentine's Day-themed content to our iOS Showcase app: Love Effects. Last week we introduced a sticker pack that let users add hearts, candy, angel wings, and other fun VDAY images to their photos. Since its release, its been our most popular sticker pack, so we think users are going to love (no pun intended) the new Love effects just as much. These effects play on red, pink, white and purple tones to bring out the romance in your photos. One of our favorites, the Heart effect desaturates your photo and adds a soft red hue throughout, while Vanilla adds pink and white light leaks that look great on brighter photos. The pack also features four more effects, appropriately named Bloom, Amethyst, Berry, and Passion. All six can be had for only $1.99. So check them out and use them like crazy this Valentine's Day. If you want to share your work with us, hit us up on Twitter. It's February, and that means Valentine's Day is quickly approaching. To mark the occasion, we're proud to announce the release of our Love Sticker Pack, available today in both our iOS and Android Showcase Apps for only $0.99. The pack features a bunch of VDAY-themed goodies like hearts, candy, angel wings, and other fun stickers to help you celebrate the day. These are perfect for adorning photos of that special someone in your life on the 14th. So check them out, spread the Love, and add all sort of Valentine's Day goodness to your photos. Want to share your Love-decorated photos with us? Hit us up on Twitter. Happy Valentine's Day!